For superfinishing of inner cutlery and stainless steel cutlery.For cooking knife, knives, carving knives, planes, chisels, scissors, electric Planer knives, and other precision blades., For superfinishing of inner cutlery and stainless steel cutlery.For cooking knife, knives, carving knives, planes, chisels, scissors, electric Planer knives, and other precision blades. The same thing was purchased as the number of finishing wheels used for many years has decreased. I am using it from time to time, but I am satisfied as a finishing stone. Because the grinding wheel is wide, we use it from the sharpening of the big blade of the electric hammer to the hammer, chisel and knife grinding. This review is about item#9182993. The 6000 was purchased for the first time, always using a diamond grinder easily. It is used for roughing finish. I felt it was big and convenient. Until now I have never used this grain size, so I bought it, fluffy stone, King grinding stone, kitchen knife was fun, it was a good shopping. I am a completely amateur, and it is an impression within the range of my hobbies. So far, I used # 3000 for finishing wheels. Although the sharpening was # 1000, I tried to challenge # 8000 with the advertisement I saw while not doing it properly, but with the budget, I hit the hand with Kinugo's # 6000. However, finishing grindstone is the first replacement in 15 years, I realize that it was good to run. It is likely to be used for a long time because the grinding stone is thick, unlike the grinding stone available at about 2000 yen. Full of feeling that it is sharpening by classic in class. 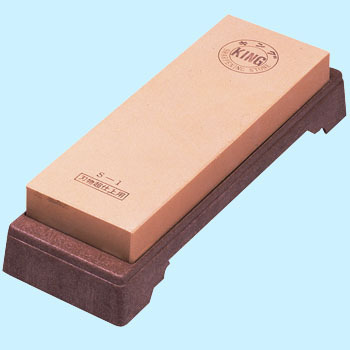 It is the royal road of sharpening stone among me. For # 6000 it is extremely handy to grind very quickly. Sharpening is also very satisfying. There are also # 4000 and # 8000 in the King, but I think that this # 6000 is the most balanced and easy to use. The difficulty is that when you are sharpening it is a little bit offensive like a dove. It can not be helped if it is due to the ingredients for good grinding. This review is about item#09182993. I think that it is easy to sharpen and the blade attachment is also good. I used the King's finishing grindstone before but it got thin and cracked on the way. I like it because I like it. I think that the best cutting edge will be attached among the artificial whetstones that I have. It seems to be the successor grindstone. It is good that the particle size is written. Even if you write it as a finishing wheel, there is a difference in the fineness of sharpening and it will be helpful because you can not make a judgment on the net by appearance. By the way the old king seems to be more granular. I bought # 60, # 1000, # 6000,. I think that it is a satisfactory product and price for everything. Makiri, Yanagi blades, stainless knives, cutting blades, fruit knives etc used for finishing. After sharpening at 2000, I finished it with a natural stone grindstone whose number is unknown, but I wanted to use a distinctive finish grinding stone for the sharpness because it is not good. I searched for it at 5000 where the shabu-torn blade's masterpiece 5000 and the king finish 6000 I found it and made it King due to the budget relationship. I tried using it but I appreciate being able to use water immediately after putting it on water. I thought that the wheels of the 5 th to 6 th generation took plenty of time and thought not to be able to cut without carefully sharpening but the King gets flattery with crunchy than 6000 and finish is shiny and spaspers It will expire. Makiri of steel also becomes shiny and newspaper can cut crisply. Next time I would like to try using Shabuton, but I will have fun for this time as it seems to be available for twice, even if I sharpen five, even twice a month.